German TenneT and Danish Energinet are working together to communicate, plan and build another high-voltage transmission line connecting the German and the Danish electricity transmission systems. It is part of a so-called European “project of common interest” (PCI). To become a PCI, a project must have a significant impact on energy markets and market integration in at least two EU countries, boost competition on energy markets and help the EU's energy security by diversifying sources, and contribute to the EU's climate and energy goals by integrating renewables. The transmission line consists of a German section from a new-build substation in Klixbüll near Niebüll in Schleswig-Holstein to the Danish border, and a Danish section starting from the German border and ending at the Endrup substation near Esbjerg in Denmark. 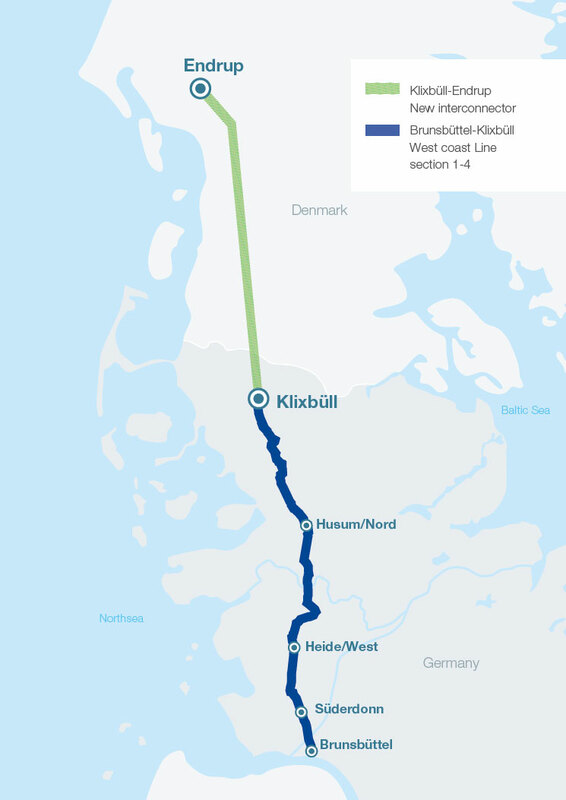 The German section of the Klixbüll - Endrup Interconnector project is also the fifth and final section of the West Coast Transmission Line from Brunsbüttel to the Danish border. 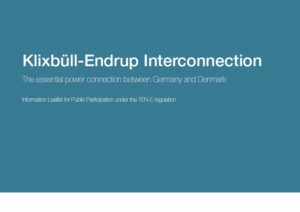 The commissioning of the Klixbüll - Endrup Interconnector will increase the physical exchange of power between Denmark and Germany. The exchange of power over this new transmission line will increase the security of supply and system stability for both power grids. Furthermore, the exchange of renewable energy, especially wind power, between the two countries will be enhanced. In addition, the realisation of this project brings obvious socioeconomic benefits for both Denmark and Germany and majorly contributes to facilitating European market integration. With these aims, the project is in line with the European Commission’s objectives for an integrated energy market through cross-border projects that link the energy systems of EU countries. The implementation of the project will thus help to ensure affordable, secure and sustainable energy for all citizens and facilitate the transmission of renewable energies to centres of consumption in Europe. The German section is approximately 18 kilometres long, running from Klixbüll near Niebüll to the crossing point at the German-Danish border near Tønder. The interconnection will be established as a 400 kV AC overhead line with two circuits. In Germany, the line will be connected to the Klixbüll substation constructed in the frame of the fourth section of the West Coast line. Learn more about the German part of the project on the TenneT website. On the website, you can also read news about the project. The website is in German. The Danish section of the interconnection is approximately 75 kilometres long, running from Endrup to the crossing point at the German-Danish border near Tønder. In Endrup, the overhead line will be connected to an existing substation. Learn more about the Danish part of the project on the Energinet website. On the website, you can also read news about the project. The website is in Danish. The new Danish-German high-voltage interconnection has been included on the EU’s list of important infrastructure projects – so-called Projects of Common Interest (PCI) – which are deemed essential to the integration of the European power grids.